sci-news.com – Radar data from NASA’s Cassini spacecraft have revealed that small lakes in the northern hemisphere of Saturn’s hazy moon Titan are surprisingly deep (approximately 330 feet, or 100 m), perched atop hills and filled with methane. Source: S.P.D. Birch, et al. Raised Rims around Titan's Sharp-Edged Depressions. Geophysical Research Letters, 2018. Source: M. Mastrogiuseppe, et al. Deep and methane-rich lakes on Titan. Nature Astronomy, 2019.
eurekalert.org – A new perspective paper from Brown University scientists establishes a framework to apply rigorous mathematical models of uncertainty originally developed for non-social situations, such as whether or not to purchase a lottery ticket, to social scenarios such as determining an interviewer's opinion of an interviewee. Source: Oriel FeldmanHall, Amitai Shenhav. Resolving uncertainty in a social world. 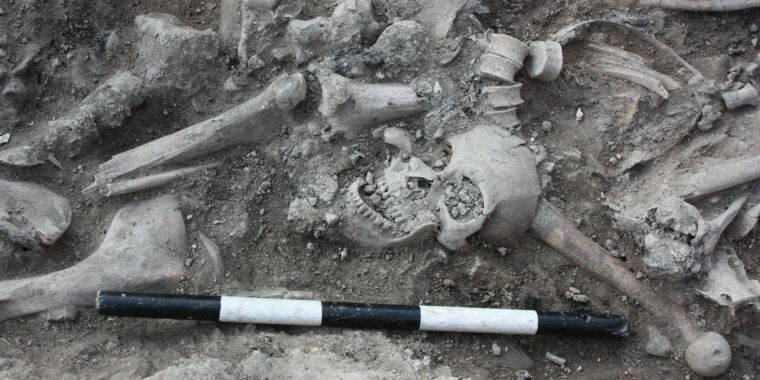 Nature Human Behaviour, 2019.
arstechnica.com – DNA suggests Crusaders intermarried with local people, and their sons also fought. Source: Marc Haber, et al. A Transient Pulse of Genetic Admixture from the Crusaders in the Near East Identified from Ancient Genome Sequences. The American Journal of Human Genetics, 2019.
sci-news.com – An early human species with a unique mix of primitive (that is, Australopithecus-like) and derived (that is, Homo sapiens-like) morphological features lived in the Philippines approximately 50,000-70,000 years ago, an international team of paleoanthropologists has found. Source: Florent Détroit, et al. A new species of Homo from the Late Pleistocene of the Philippines. Nature, 2019. Source: Nita A. Farahany, Henry T. Greely, Charles M. Giattino. Part-revived pig brains raise slew of ethical quandaries. Nature, 2019.
livescience.com – Eight infants with a severe immune disorder, known as "bubble boy disease," appear to be cured of the disease thanks to an experimental gene therapy. Source: Ewelina Mamcarz, et al. Lentiviral Gene Therapy Combined with Low-Dose Busulfan in Infants with SCID-X1. New England Journal of Medicine, 2019.
sci-news.com – A meteor seen over the South Pacific, off the northern coast of Papua New Guinea, in 2014 likely came from interstellar space, according to new research from Harvard University. Source: Amir Siraj, Abraham Loeb. Discovery of a Meteor of Interstellar Origin. arXiv, 2019. Source: Salvador J. Jorgensen, et al. Killer whales redistribute white shark foraging pressure on seals. Scientific Reports, 2019.
discovermagazine.com – Researchers get the first-ever glimpse into how ketamine works its antidepressant magic in the brain. Source: Sustained rescue of prefrontal circuit dysfunction by antidepressant-induced spine formation. Science, 2019.